Pocket kings are the second best starting hand in Texas Holdem. There is no other starting hand in hold'em except pocket aces that are stronger pre-flop. However, just like "pocket rockets", the "cowboys" can also get you into trouble at the tables. You must be aware that KK is a very vulnerable hand as any ace that appears on the board could easily pair with an opponent's holecard to give them the higher pair than you. Even if your opponents do not have an ace in the hole, the mere presence of an ace on the board can be enough to scare you away from betting as heavily and extracting maximum profit from the hand. There is roughly a 20% chance that an ace will fall on any flop, which is more often than you would think. For these reasons it is important to bet or raise with pocket kings pre-flop. Similarly to pocket aces, you do not want to be in a multi-way pot when seeing the flop, otherwise you will be giving your opponents a greater opportunity to take the pot away from you, so you will want to be seeing a flop with a maximum 2 opponents only. You want to raise enough to weed out the weaker hands, and enough to know that your opponents will have at least an ace to call you. This means that you can give yourself a greater ability to put your opponent on a hand, and giving yourself a better opportunity to fold to significant signs of strength if the ace does hit the board. Post-flop play with pocket kings can be sub divided into two situations. This situation is far more pleasant than the second, but it does not mean you are home and dry yet. If you do not make a set you still only have that one pair, so we are in no position to be slowplaying our hand just yet. You want to play this kind of flop in a similar way to the way you would play pocket aces on the flop, by betting and raising as much as possible to extract a decent amount of money from players who cannot let go of top pair. Furthermore, you want to continue to make sure that your opponents are not receiving the correct pot odds to chase after any flush or straight draws. Even if the flop looks pretty safe and doesn't offer up any obvious draws, I am still going to be betting and raising strongly to avoid letting other players catch up and make two pair or better. In addition, you don't build a big pot by checking and calling, so grab the bull by the horns and start playing some aggressive poker. If your opponents immediately fold, it's no big loss, as it would never have developed into a big pot at any stage of the hand anyway. Don't be afraid to bet with an overpair like pocket kings. You don't win big pots by playing passively. This is obviously the less favourable position on the flop, because if your opponent holds an ace then he has already got you beat. As already mentioned the presence of an ace on the board is enough to prevent you from obtaining any substantial amount from your opponent if you do hold the best hand because the ace will slow your betting down. This means that your main objective on this flop is to determine whether or not your opponent does indeed hold the ace. This can be done by betting in such a manner that will give you as much information as possible depending on what action your opponent takes. Unfortunately there are no definitive plays to help determine your opponent's hand, so you will have to rely on your knowledge about your opponent to influence what plays you think you should make. As a rule of thumb, I will generally make a continuation bet and go from there. If I get called, I evaluate the situation to the best of my ability to try and figure out whether to fire again on the turn. At the end of the day though, an ace on the flop really does throw a spanner in the works when you hold pocket kings, and there is not a lot that you can do about it. Just try your best to salvage the situation. A continuation bet is always a good starting point. A continuation is always a good place to start when an ace falls on the flop when you hold pocket kings. 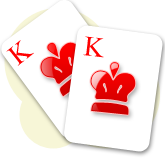 Many beginner players find it hard to let go of pocket kings even with an ace on the board. The fact that they hold the second best starting hand clouds their mind to the fact that they are easily beaten, and continue to see the hand through and end up losing a decent amount of chips to their opponent that did indeed pair their ace. With aces and kings, it is best to remember that there are many hands that can beat you after the flop, because if you do not hit a set, you only have one pair at the end of the day. Try to look more toward the ways in which you can lose, instead of the ways in which you can win, without obscuring your mind too much with negativity. As a general rule of thumb, bet strongly and avoid slowplaying your hand. You don't want to give opponents the opportunity to catch up and take a big pot away from you.